The Angel Falls cascade down a 2560 meter-high table mountain. 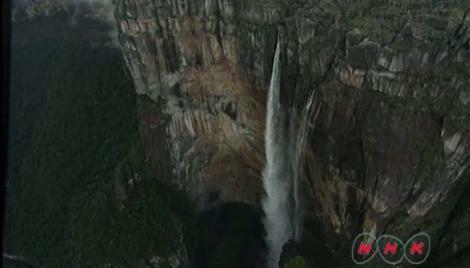 The 979m waterfall is the world's tallest. The water turns to spray before it reaches the foot of the mountain and provides moisture to the tropical forest. The Guyana Highlands were a lake at the time South America was connected to the African continent.The mantle beneath rose some 200 million years ago, resulting in the elevation of the lake floor. The formation of table mountains is a result of the erosion of softer rocks by wind and rain. A German explorer named Robert Schomburgk visited in 1835. He was fascinated by the table mountains, known locally as "tepui". His effort to climb one of the tepuis was hampered by its steep cliffs. It was only in 1884, almost fifty years later, that a team reached the top of a table mountain. A British expedition team led by Everard Im Thurn succeeded in reaching the highest peak, Roraima. This is the view at the top.There are curiously shaped rocks, formed over millions of years as land was gradually eroded. Endemic species can be found here. High humidity helps moss to grow, and in turn the moss becomes a bed for other plants to flourish. Plants have evolved to adjust to an environment where there are only rocky surfaces. The British writer Sir Arthur Conan Doyle dubbed this place "The Lost World". The Guyana Highlands with its mysterious beauty continues to capture our imagination.